You must be at least 21 years of age to purchase wine. By placing your order on top wines you have represented to Grapeswine.com that you are at least 21. All alcoholic beverages that we ship on your behalf must be received and signed for by an adult of legal drinking age; this also includes items shipped out of the United States. Due to federal and state regulations, all wine shipments must be received by an adult 21 years of age or older. An adult must be physically present to sign for the wine delivery. Therefore we recommend that you ship to a business address. Federal regulations also make it illegal to ship wine to post office boxes. We cannot schedule shipments for a specific time during the day. Please Note - we are committed to getting your order out as quickly as possible. It takes time to pull, assemble and process. We work with many small companies to ensure the best price. At times, there may be delivery delays due to, but not limited to, weather or warehouse closures. If your order is "Time Sensitive", please enter a note in "Special Instructions" upon submission of your order or contact us 1-800-434-9463. 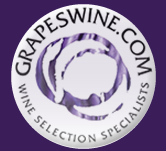 At GrapesWine.com we navigate the complicated system of wineries and suppliers to acquire the best wines around the world for our customers. As a company we always strive to make sure our customers’ orders are fulfilled in a timely fashion and typically your order will ship within 7-10 business days. However, depending on the wines you are ordering and the location they are being shipped to there can be delays. If you need your wine by a specific date please contact us at service@grapeswine.com or call 1-800-434-WINE and our expert wine advisors can assist you. Please Note - we do not ship to the following states: ALASKA, ARKANSAS, HAWAII, KENTUCKY, MISSISSIPPI, UTAH - Please call us for an update 800-434-9463. Accuracy and Pricing Every effort has been made to ensure accuracy, but in the event of a web misprint, price posted in our store will prevail. Thank you for enjoying the best deals on wine, anywhere! Title to, and ownership of, all wine passes from Grapeswine.com to the purchaser in the state of Connecticut or New York to his / her home state. By arranging for transportation of wine, Grapeswine.com is providing a service to, and acting on behalf of the purchaser. By utilizing this service from Grapeswine.com, purchaser is representing that he / she is acting in a fashion compliant with his / her local and state laws regarding the purchase, transportation and delivery of wine. The purchaser represents that he / she has obtained any required permission, paid any required fees, is working through properly licensed intermediaries where required, is legally entitled to take possession of wine and is legally entitled to take quantities ordered. And once again authorizes that he / she is 21 years of age. We reserve the right to limit quantity while supplies last. Prices are subject to change without notice. Not responsible for typographical errors. Prices do not include sales tax. Sales tax added where applicable.